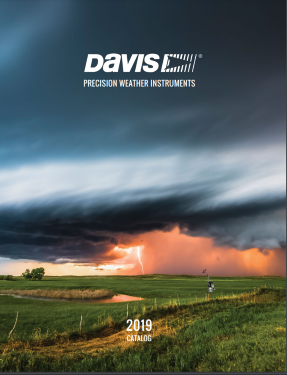 The official Davis 2019 catalogue is now available. For a PDF copy please click the catalogue cover image alongside (but be aware that it is a large 40MB download) and we do also have a a limited number of printed copies available to customers who are ready to purchase a new station. While the catalogue is still very recognisable as the familiar Davis main brochure, it has undergone a substantial redesign and reordering of content this year, with several new pages of product comparison to help choose the optimum item, especially amongst devices uploading to the weatherlink.com online weather network. Weatherlink Live is a data handling device able to receive transmissions from all Vue and VP2 ISS and other transmitters and able to upload data to weatherlink.com and to local networks via WiFi or traditional cabled Ethernet. WLL will effectively supersede the WeatherlinkIP logger, which is therefore expected to be discontinued once WLL becomes available. Further details of WLL will be provided closer to the launch date, but feel free to contact us beforehand if you have any special interest or questions about this new product. 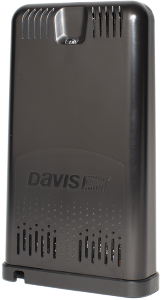 Check this page regularly for the latest news on Davis weather stations and other makes and products that we sell. This column also shows the latest software and firmware versions currently available and other continuing topics of interest. We often have small background development projects that we'd like to pursue but that we don't have time to resource fully. Please email us if you might be interested in collaborating on these - more details on request. We'd like to hear from anyone able to call in (to Ely - near Cambridge) for a chat in person and who might have skills/interests in weather data and/or programming. These are typically small projects that might be of interest to hobbyists but which are non-commercial in nature. So, in general, we're not in a position to offer employment or substantive payment, but what we can do is to offer ideas, discussion and eg the loan of hardware to anyone who might be interested in collaborating in a worthwhile hobby project. However, there might be the possibility of some modest quid pro quo and if any projects prove unexpectedly successful then we'd be happy to discuss options for further joint development & marketing.